LTG Aktiengesellschaft looks back on the very successful participation in the ICE Europe last week in Munich. 463 exhibitors made the 11th edition of the International Trade Fair for the Finishing and Converting of Paper, Film & Film bigger than ever before. LTG, too, can look back on a promising participation in the trade fair and thanks all those who visited us as well as all those who made it possible for our participation in the ICE Europe to take place so smoothly. 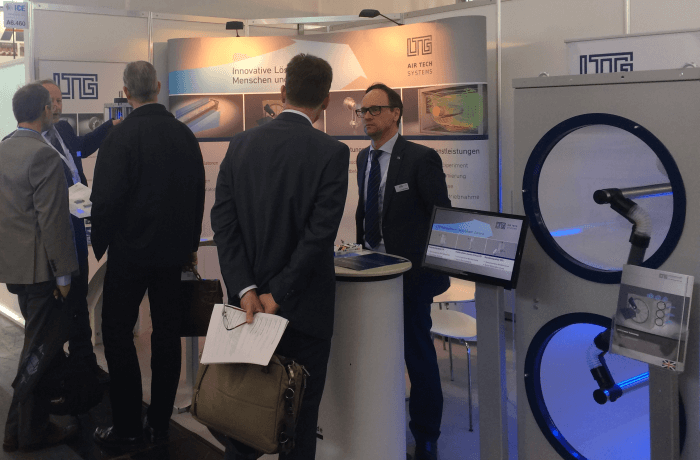 LTG presented its extensive portfolio for various air technology tasks in the converting industry to international visitors on three busy days. LTG’s presence was on the one hand focused on tangential fans, which due their various technical advantages, above all the wide airflow over large areas, contribute to rationalization and efficiency in all converting applications. The second focus was on LTG Filtration Technology. It ensures clean air in the production and processing of paper, film, foil and nonwovens. Fibers, dusts, granules or edge strips produced and released in the production process can be filtered, compacted, separated or humidified with LTG components and further be processed or recycled. Converting experts, of course, know their production processes inside out, but when it comes to air technological optimization, LTG engineering services can help to find new approaches. Our experienced engineers optimize production processes both in the laboratory and directly at existing plants on-site. extensive product range of LTG Filtration Technology.